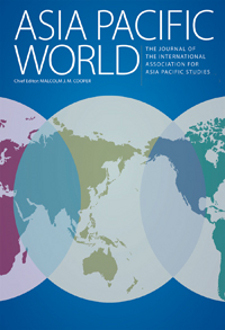 Asia Pacific World is a peer-reviewed, scholarly journal that focuses on the social, political, cultural and economic development of the Asia Pacific region. The Journal discusses issues of current and future concern for the Asia Pacific, and its relations with the rest of the world. A forum for scholars carrying out research on the region, Asia Pacific World presents cutting edge analysis and invites contributions from a wide range of disciplines to explore their impact on the region. These areas include, but are not limited to, Sociology and Cultural Studies, History, Politics and International Relations, Finance, International Business Management, Innovation, Economic Development, Social Welfare, Tourism, Environment, ICT, New Media, Management, and Linguistics.